This particular bulla is an extremely rare and valuable artifact to have in the Collection, not only because of its age, but also because it was issued by the Medici Pope, Leo X, during an era that presaged the Protestant Reformation. 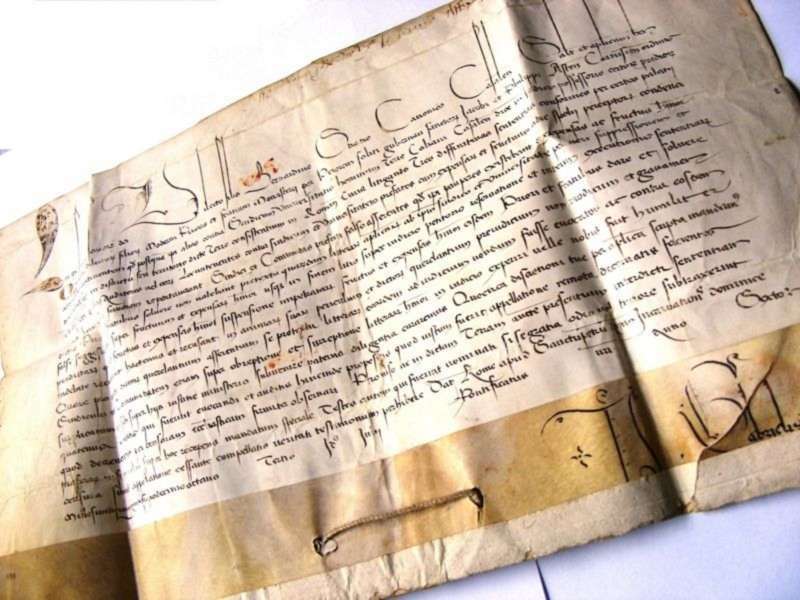 In fact, this document was issued in 1517, the same year that Martin Luther drifted into open rebellion with the Catholic church and posted his 95 Theses on the door of the Wittenberg Cathedral on October 31st of that year.The actual bulla on this document, displaying Leo PAPA X, on one side, has the traditional image of Saints Peter & Paul on the other side with a variation on bullae: this one has the addition of the Medici symbol of five balls, which figure heavily in architecture in both Rome and in Florence, seat of the Medici family. 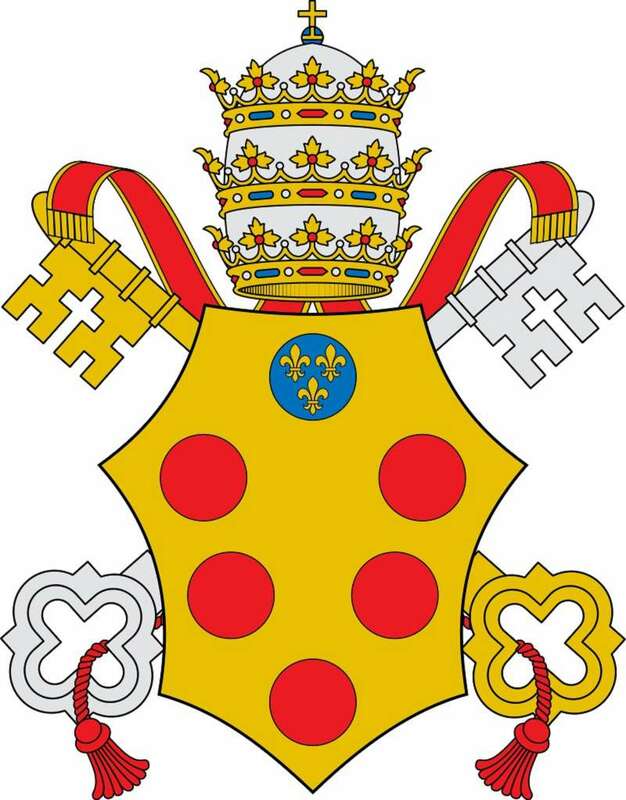 Pope Leo X’s coat of arms also has that image and immediately identifies him as a Medici. According to Father Kunst, it is a design he has never seen on a bulla. Stories abound on the internet as to the true meaning of the five balls, but no one knows for sure. The word, bulla comes from the Latin, bubble. It is the lead seal that was appended to the end of a document acting as the signature of the pope. On one side, it contains the pope’s name and on the other, images of Saints Peter and Paul from whom he is given his authority. The bull is generally an official document of the Holy Father. We know by the choice of threading used, either silk or twine, the importance of any particular bull. Pope Leo X is a very significant historical figure who was Pope from 1513-1521. The year is legible (1506) and the signature is complete. Here the initials before the j.o. stand for something else, but they are indeed present and fully legible. This piece, the end of a signed letter, is not “glued “to anything. It was submitted to an expensive professional restoration where Japanese paper pulp was reintegrated into the missing parts to return the piece to a more attractive square format. Given the age and rarity of the document, this is an incredible addition to the Collection. 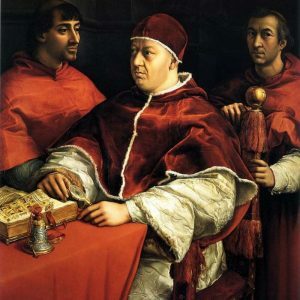 Pope Leo X was created Cardinal at the age of 13 in 1488 and was formally received into the College of Cardinals in 1492. 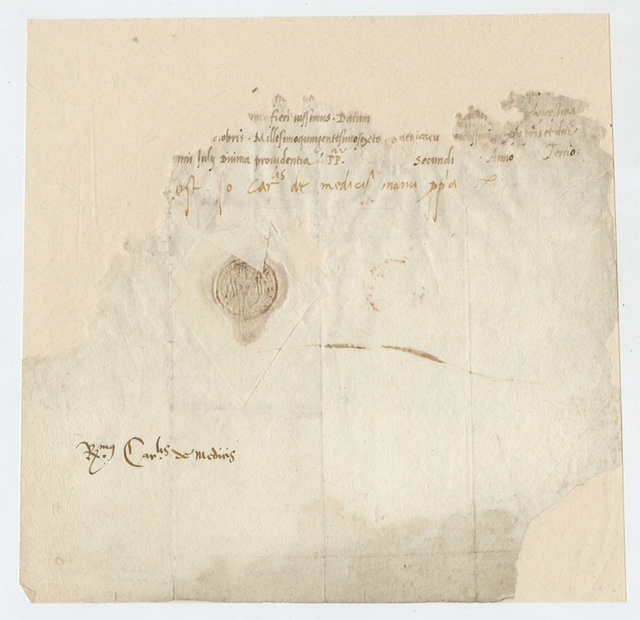 His signature on this document is from his time as Cardinal. 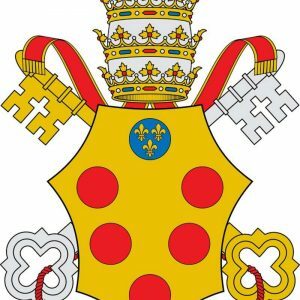 In order to understand the papacy of Pope Leo X, one must have some understanding of the family from which he came: the Medici’s of Florence. Giovanni de’ Medici was born at Florence in 1475, the son of the man known as Lorenzo the Magnificent. The boy was destined for the Church and tonsured at the young age of seven. A sidelight is he was raised with his cousin, Giulio, who was also destined for a career in the Church and even followed Giovanni’s papacy in 1523, becoming Pope Clement VII. The Medici family embraced Michelangelo in his youth, offering the young sculptor their home and all the amenities connected to it. Giovanni eventually became the abbot of several monasteries. He was created a cardinal at thirteen and became Pope Leo X at the age of thirty-eight. Raised in unlimited wealth, with brilliant tutors, Giovanni thrived. Then a bloody civil war erupted in Florence, sparked by resentment of Medici wealth and power. The end result was all traces of the Medici’s were destroyed and the family was sent into exile. It was nine years of wandering through Italy, dependent upon friends, before the two cousins arrived in Rome at the court of Pope Julius II. Their future political prowess depended upon their return to power in Florence. Giovanni and Giulio, with the help of an army provided by a sympathetic Pope Julius II, were able to return to Florence and regain the power lost a decade earlier. This occurred in 1512. The people of Florence were outnumbered by the army, although they had enlisted the aid of thousands of recruits throughout Tuscany. But the papal army was already carving a bloody path on their way to Florence, all in the name of the Medici’s. The massacre was so heinous the people of Florence surrendered and power was returned to the Medici’s. Soon after, Pope Julius II died in 1513, and both the Medici cousins were considered contenders for the papal throne because of their international profiles. Amid plotting and intrigue, and after a week into the conclave, when their food rations were reduced to a single, unappetizing meal, the cardinals arrived at their decision. Giovanni de’ Medici would become Pope Leo X. The deciding vote was cast by Giulio de’ Medici who announced the winner. It was 1513. He would reign until 1521. At this point, the city of Florence forgave all past resentments towards the Medici’s and welcomed him back with open arms. He was the first person born in Florence to occupy the papacy. Within a month, he raised Giulio to the cardinalate. His conduct as Pope was not complimentary. Dinners were held nightly with up to sixty-five courses. It is said he had over six hundred servants and even an elephant. He loved parties and games and all forms of amusement. Hunting was a favorite past time. There was no scandal in his personal life before or after his election. 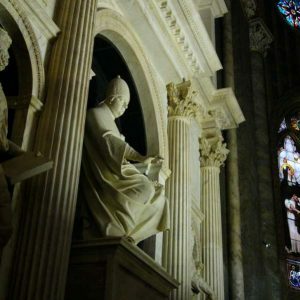 It wasn’t personal scandal that characterized his papacy; it was the scandalous use of papal funds to such a degree he stooped to immoral methods of collecting money, primarily, the selling of indulgences. Although he completed the Fifth Lateran Council begun by Julius II, he did little to carry out the decrees that were passed. He did enter into an agreement with Francis I of France, known as the Concordat of Bologna. It gave the king the power to name bishops and abbots and gave monarchs advantages that lead to corruption in the French church. An attempt was made on Pope Leo’s life, but he discovered the plot, had the guilty cardinal executed and promptly created thirty-one new cardinals, more than doubling the number and assuring a diminished power of the college. The Medici Pope and his Cardinal cousin, Giulio, worked to secure their power and safety. Leo created hundreds of jobs in the Vatican and sold them, hiring all relatives and ensuring loyalty from them. He had emptied the coffers of the Vatican and was sorely in need of money as he owed money to every bank in Rome. Meanwhile his cousin was selling the papal jewels. The rebuilding of Saint Peter’s Basilica was begun at this time, with Raphael appointed to proceed. Due to lack of funds, no building could occur until indulgences were sold to raise the funds. He sold them at an unparalleled rate by itinerant preachers all over Europe. It became a veritable gold mine for the Pope. This method of raising funds lifted him out of debt. It was his arrangement with a German archbishop who allowed the preacher, Johann Tetzel, to solicit funds from the German people that incited the wrath of one man in particular. When an Augustinian monk, Martin Luther, continued to protest this outrage vehemently, it was as if Pope Leo was unaware of the implications of his wrongdoing or the political overtones erupting in Germany and elsewhere. In October of 1517, Luther published his 95 Theses, which were a direct attack on the Pope’s immorality regarding the sale of forgiveness. An even bigger contributor to Luther’s attack on the Pope was what has come to be known as “justification by faith”, which was Luther’s belief, and differed from the Catholic Church’s insistence on both faith and good works. Luther believed the Pope was the richest man in the world and should use his own money to build Saint Peter’s and not pass off as a “good work” buying an indulgence as a way to contribute to the building. In all of this, Leo missed the mark. While Luther was making great use of the printing press and distributing flyers about his 95 Theses everywhere, the Pope remained numb to the decisive turn of events sweeping across the continent. Eventually, Leo condemned Luther with a bull in 1520 and excommunication in another bull in 1521. There is no doubt this accelerated the course of events to follow: the Protestant Reformation. Meanwhile, Spain and France and England all were ratcheting up the pieces in a movement that would become unstoppable. And in the East, the Turkish offensive was a grave threat. In many ways, there are similarities between this time frame and our own. Both eras demanded and lacked the leadership to turn the state of the world in a direction toward peace. There is a probable suspicion that Leo’s death, thought to be from malaria, most probably was due to poison administered by the papal cupbearer, Bernarbo Malaspina. Documents that have only recently become available support this theory. It is interesting that Leo X was the last pope to be the victim of a violent death although two recent popes, the soon to be Blessed Paul VI and Saint John Paul II both suffered attempts on their lives. Pope Leo X died on December 1, 1521, having had little or no success as a ruling pontiff. 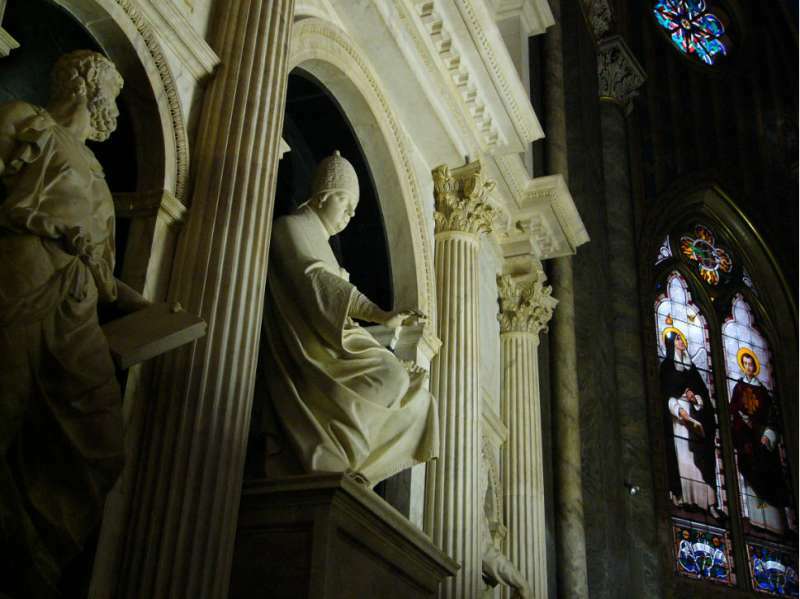 He was buried in Santa Maria sopra Minerva. He would have preferred to be remembered for his vast patronage of the arts, for splendid buildings and the refurbishing of Rome and Florence where the coat of arms of the Medici abounded, including on the bulla of the artifact you see here. Instead, he is remembered as vindictive and unable to handle the myriad crises that occurred during his papacy. With him, the time of popes’ abilities to suppress dissidents ended. The Protestant Reformation was about to begin. It would be years before the Catholic (Counter) Reformation would answer Luther’s call. 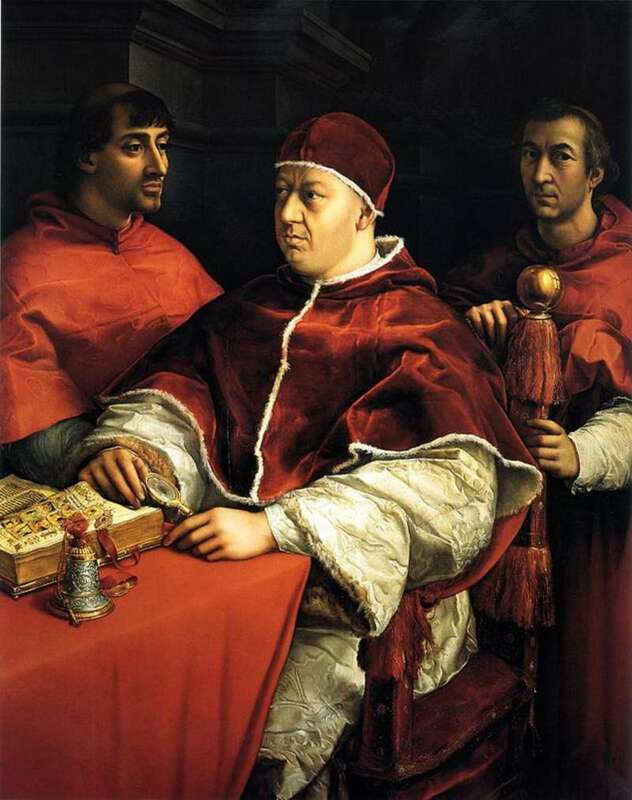 The Portrait of Pope Leo X with two Cardinals is a painting by the Italian High Renaissance master Raphael, circa 1517. It is housed in the Uffizi Gallery of Florence. In contrast to works depicting classical, idealized Madonnas and figures from antiquity, this portrait shows the sitter in a realistic manner. The Pope is depicted with the weight of late middle age, while his sight appears to be strained. The painting sets up a series of visual contradictions between appearance and reality, intended by Raphael to reflect the unrest of a period of turmoil for the papacy. Martin Luther had recently challenged papal authority, listing among other grievances, Leo X’s method of selling indulgences to fund work on St Peter’s. The pommel on top of the Pope’s chair evokes the symbolic abacus balls of the Medici family, while the illuminated Bible open on the table has been identified as the Hamilton Bible. The cardinals are usually identified as Giulio di Giuliano de’ Medici and Luigi de’ Rossi. Giulio de’ Medici, the cardinal on the left, became Pope Clement VII in 1523 and ruled for eleven ineffective years that found him on the wrong side of every political and diplomatic decision he made. He was the illigimate son of Giuliano de’ Medici who was assassinated in the Pazzi conspiracy.